A major advancement for photography came in 1931 when Harold Edgerton (1903-1990) invented ultra-high-speed and stop-action photography. 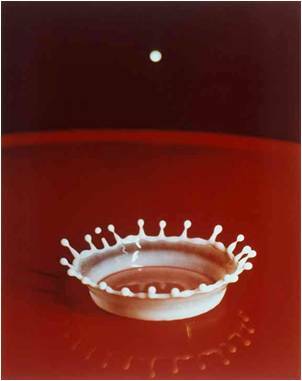 Edgerton used his invention to capture events too fast to see with the human eye, such as droplets of liquid splashing and bullets flying through mid-air. Edgerton, Harold E. Milkdrop Coronet – 1957. MIT Museum, Cambridge MA. HEE-NC-57001. MIT Museum, Edgerton Digital Collections. Accessed: 22 July 2010.